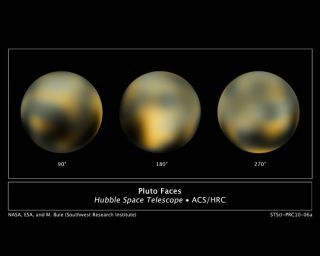 Images of the dwarf planet Pluto taken by NASA's Hubble Space Telescope. Pluto was discovered 80 years ago today, and astronomers are still arguing over what it is. The oddball world, downgraded from planet to dwarf planet status in 2006 and then later reclassified, is really out there. Scientists aren't sure exactly what Pluto's made of, how it formed, or why it orbits so oddly compared to the eight primary planets. And there are at least two camps of astronomers when it comes to defining Pluto. Some just think of it as a planet, others call it a dwarf planet or a plutoid. While NASA has a spacecraft en route to Pluto and slated to make close-up images in 2015, the best images of Pluto so far, taken this year by the Hubble Space Telescope, are mere smudges. The hunt for Pluto began in 1905 when Percival Lowell (of Martian Canal infamy) hypothesized about the possibility of a Planet X in the outer solar system. Lowell died before Pluto was discovered. Clyde Tombaugh found it on Feb. 18, 1930 in a concerted scan of the sky. Tombaugh compared two photographs taken at the Lowell Observatory and noted the object's movement against the background of stars. Most of Pluto's orbit is out beyond that of Neptune. But the path is oblong, so Pluto spends part of its 248-year orbit – the time it takes to make one circle around the Sun – inside the track of Neptune. Pluto's path is also extremely inclined, by 17.1 degrees, to the main plane of the solar system where the other planets travel. Asteroids also circle the Sun in the solar system's main plane. So do some comets. But many comets, like Pluto, have highly inclined orbits. This similarity, plus Pluto's small size – smaller than Earth's Moon – led to its demotion. Studies in 2003 showed that despite an almost nonexistent atmosphere, Pluto has wind and seasons and appears to have recently gone through a phase of global warming. The leading theory for the formation of Pluto and its largest moon, Charon, is a wild one: A nascent Pluto was struck by another Pluto-sized object. Imagine a glancing blow and a lot of cosmic Silly Putty getting stretched and repacked into new spheres with new rotations. Observational evidence for this collision theory remain thin, however. Charon is much bigger than any other moon in relation to the size of its host planet, further muddying Pluto's status. Some astronomers think of the setup as a double planet.